The Manchester Cenotaph, built in Portland stone, was erected in 1924 as a memorial to those who lost their lives in the First World War. Designed by Sir Edwin Lutyens, it is similar the Cenotaph in Whitehall which was also designed by Lutyens; "a pylon in diminishing stages with a figure of the Unknown Soldier draped in a greatcoat on top". The Cenotaph is designated by English Heritage as a Grade II* listed building (English Heritage ID:457622 Link British Listed Buildings). 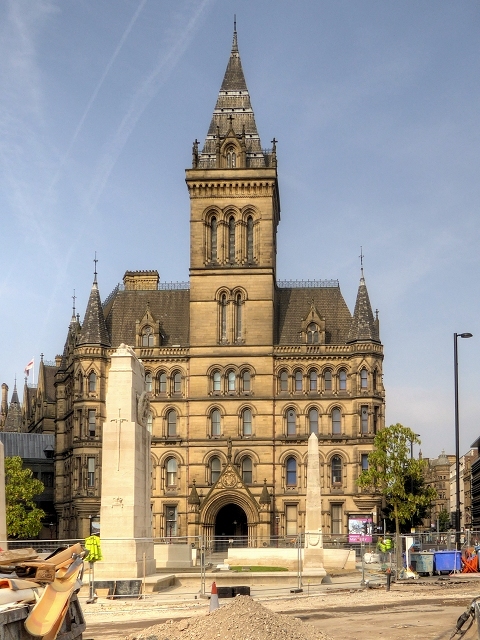 It now stands outside Manchester Town Hall, a stunning Neo-Gothic building completed in 1877 and rated by English Heritage as a Grade I listed building in 1952.